I will next time talk about the easier option – the guy who is not specially fashionable but just wants to avoid pitfalls and situations where he might think there is a chance of detection. But in this piece I am looking specifically at how to handle elevators if you are very fashion conscious. The first thing is that fashions change. Not usually fast, but they change. And sometimes you DO get that quick seachange which means that all of a sudden something that was clinging on in fashion terms becomes, well, just deeply uncool. And fashion can be fab for elevators one minute and really problematic the next. You are having to learn new techniques. Under pressure. I am in my mid 30s and work in clubs and bars, an industry that is very fashion-oriented. 15 years ago, to my total joy, flares were all the rage, specially in the UK and Europe. And my God they could hide a multitude of sins against your natural height – I never wore elevators in those days as (unlike today!) I couldn’t find anything that wasn’t total crap. So I bought fashion footwear in a couple of sizes larger and rammed them with lifts. And in flares? Wow, you could go totally crazy. They were long-legged and wide-flared, draped right over covering the boot almost to the ground, often on the ground just and just. And so you could add SOOOO much height. When the flares trend died down completely and we all went skinny around a decade ago, I was in despair right at first. Don’t get me wrong, I LOVE the look and style of skinny jeans and the new materials (with stretch in them, skintight, incredibly comfortable etc). But I could not do what I had been doing for half a decade – filling my boots in the same way. And so I had to work out ways of trying to keep my new height. And I learned one thing reasonably quickly (and it’s the message I am really trying to send you now, to pick up on faster than I was able to): it’s all about confidence and carrying it off. And about the fact that today’s elevators mean that you no longer really have to HIDE the boots. My normal shoes rammed with elevators back in the day had to have the zips down and would not bear inspection. So flares were great cos they hid everything. Today that is NOT the case and it isn’t necessary to hide the boots. So with fashion styles, take some time to quickly learn the new looks that suit you, stay in touch with all trends and make sure that you work out ways of making sure that your added height FITS the new looks. So on that subject of the trend for skinny which remains entrenched in spite of fashionistas saying “it’s coming to an end” for the past five years. There’s a reason why they are popular – they flatter, and slight variations and styles and material continue to appear and appeal, keeping the look alive. Now right at first I thought “Love skinny jeans but I can’t wear them real tight because of my elevators (too obvious, too clumpy etc)”. But this is just NOT the case. And it was a wrong attitude. Yes, if you do it wrong, it can look wrong. But do it right and it looks superb. In fact, a really good pair of elevators up to 4” which fit snugly where they meet the leg and the hem of the pants looks very right and easy to finesse, and is a look that loads of guys wear anyway (big boots and skintight skinnies). Higher just takes a bit more thought and practice but I now do it and love it. 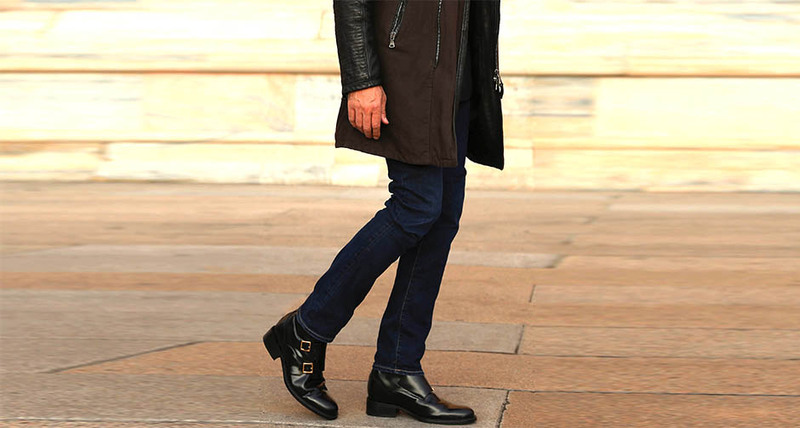 So yes, the boots are well on show in skinny or close fit jeans (which they are not under bootcut or the looser styles). But there’s a logic here – no-one knows you are wearing elevators. Yes, they know you are wearing big boots but so are many others. They do not attribute a 4” (10cm) lift in your height to your boots – just a bit of footwear advantage that any guy wearing workboots or Timberlands gets. In many of the more high fashion shots that GuidoMaggi do, they show off the boots a lot. I had my reservations about this at first, but having tried it out myself I realize it works – you just don’t always have to hide the boot, and with some looks it’s best that they are actually well on show (eg hem slightly rolled up very tight over the boot showing a fair amount of leather). There’s an important issue here – it is about looking carefully at how these styles are being worn by non-elevator wearers and matching the look. OK some styling is just too high fashion for many guys, so take it down a notch and look at the commercial looks from high street brands. When I bought my skinnies, many came from the UK store Topman and it was really interesting looking at their site and seeing how they presented them, and with what footwear – they tend to show various models and different styles of the pants and (crucially) the footwear. OK there were the usual sneakers etc, but many were shown with guys wearing huge great boots and they looked excellent. Same with guys on sites like lookbook.nu. It was easy for me to think, “wow, I can copy that look but wearing my elevators”. And you learn by experiment and copying what looks good and works and what might not. I myself have to compromise with my looks – I like my skintight skinny jeans but I am still careful about wearing them with my 6” Hong Kong elevators! I have done it and it is fine. But usually I wear my 4” boots with skinnies because I find it easier to get my look right. If I go for the 6” boots, I have to do a lot more finessing of the hem of the jeans of my skinnies before venturing out with them. But yes, it IS do-able, which I doubted a couple of years ago. With my 6” boots, I tend usually to wear slimfit in brands I like (rather than skinny). I play around with the hem to make them hang well over the boot. And all the time I try stuff on, I am first and foremost planning to make sure of how it would look with my varying boots. So if you are of that age or inclination where you want to go for a higher fashion look, almost anything is now possible with added height right up to the new 6” boots: you just need to try stuff out and keep your eye on the look you are creating and how far it matches the overall look you want to create. Keep the line looking good (which is why I often like black boots and black jeans myself, for simplicity) and experiment.